choir croak out them goodies: I guess 1982 has officially passed. I guess 1982 has officially passed. 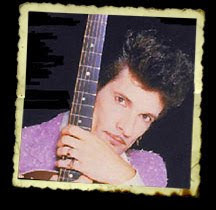 Apparently everybody's dying these days; Willy DeVille, of onetime Mink DeVille fame, died August 6 of pancreatic cancer, which had allegedly only been discovered during preparation for hepatitis C treatment. Willy/Mink DeVille didn't have the same impact on me as, say, the Cramps (so there aren't any long, sad anecdotes to share as there had been for Lux Interior), but I would like to share "Spanish Stroll." Why? A few years ago, while listening to Steve Jones' Jonesy's Jukebox on the radio, I once heard "Spanish Stroll" and found it pleasantly kitschy, pleasantly poppy...just pleasant. And then I snapped up a bunch of Mink DeVille records (which are, I hate to say it, easily accessible in most vinyl bins for under five bucks), and had a nice listening party with the self. Have a listen and perhaps do the same. In news nearly as depressing, Richard Hell is going to release Destiny Street Repaired on September 1, and it's available for complete, free stream until August 12. What is it? It's a re-done version of Richard Hell and the Voidoids' Destiny Street, complete with rhythm tracks spared from the 1982 recording, though this time with new lead guitar and vocal tracks that've been recently recorded. Is it necessary? Absolutely not. Is it something over which to be curious? A little bit. There's an anecdote that comes with this, too. About four years ago, I had a chance to meet Richard Hell at a meet-and-greet in New York, and though I was initially put off by his shiny button-down, I was charmed by his authentic slur and learned that he's actually a really nice guy. We had a good one-on-one chat for a few minutes, though mostly about his cat, which he imitated quite well, and by the time I'd left, realizing, sweet Jesus, I just heard Richard Hell meow, it occurred to me that an aging punk rocker is just an aging man with a slur leftover from whatever drugs he's once done. And that is exactly what Destiny Street Repaired sounds like. Stream Destiny Street Repaired in its entirety. And, hell, pre-order the vinyl so you can get his autograph.